Jeff Goodby and Rich Silverstein to be honored by Cannes. Thank you Jeff Goodby and Rich Silverstein. And congratulations on being 2019’s Cannes Lions Lifetime Achievement Honorees. You are responsible for the birth of multiple top advertising agencies including Butler, Shine, Stern & Partners, Venables Bell and Partners, BarrettSF, Black Rocket, Heat, Cutwater, Division of Labor, Funworks, Muhtayzik Hoffer, Erich and Kallman, Eleven, Mutt, Creature, Tool, Argonaut, Chemistry Club, Mad Dogs and Englishman and countless other marketing agencies that we forgot to mention but welcome in the comments section so we can update. We are all in your debt. The small agency blog is produced by Division of Labor; a top advertising agency and digital marketing agency in San Francisco specializing in brand marketing and digital advertising campaigns. Clients include Ford, Dropbox, Roku and San Jose Sharks. We offer the services you’d expect from an integrated, digital marketing agency, but we also offer hourly, brand consulting services for startups, smaller companies and brands that want to start doing something, but aren’t ready to get into a big integrated campaign or media spend. We can help with brand strategy, brand voice, early stage asset development and other communications to get things up and running without breaking the bank. Click here for a free consultation. Thanks to the workers at Gianola Awnings for starring in our moving video. After eight years in the same office, the Division of Labor finally outgrew our space and has relocated. We considered joining the glut of top advertising agencies based in San Francisco, but in the end, couldn’t quit our love affair with salty Sausalito. We have, however, moved a little further from the fudge shops and souvenir stores to fly under the radar of curious European tourists. 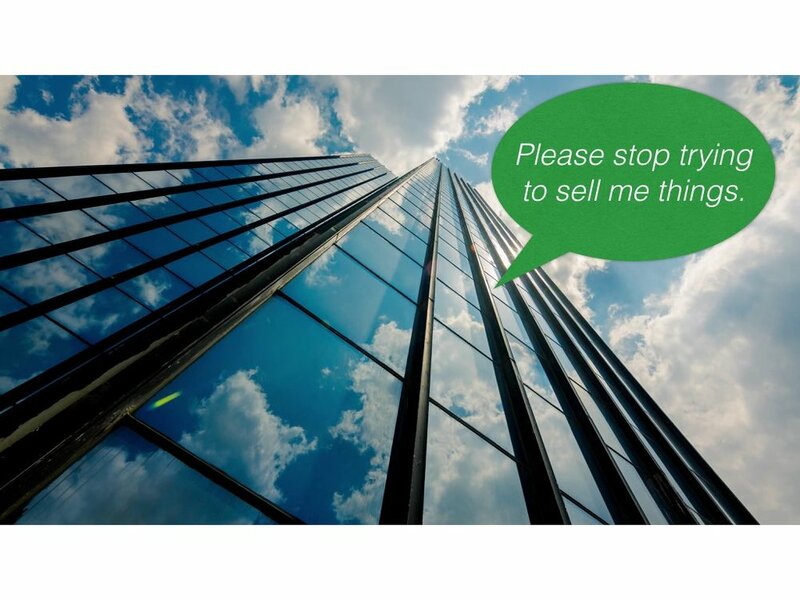 It was charming, at first, when folks stumbled into our office with their fanny packs and selfie sticks and began flipping over office chairs in search of price tags. We also loved it when some of the Sausalito locals, often wreaking of gin— dropped in to share their unsolicited political opinions. Guiding them out the door when they outstayed their welcome was less pleasant. On the bright side, it was a great way to hone our conflict resolution skills. Is our new space a little more grown up? Maybe a little. But it’s twice the size and has assigned parking spaces. And it’s clear that stress levels are down now that our employees no longer live in fear of the meter maids. Of course, we miss our lattes from Cibo and especially their pastries. But the Nespresso machine in our new kitchen makes a decent cup of coffee. Pair it with a PopTart, purchased in bulk for employee consumption, and quality of life at the new Division of Labor headquarters is pretty sweet. On a final note: If any Kellogg or Nespresso executives happen upon this blog post and need help with data-driven marketing strategies and require the services of an agency in San Francisco, we’re already brand loyal. How to launch a new product and a new category at the same time. How do you launch a new product, like Opendoor, to a real estate market that hasn’t yet heard of the category? This is the marketing dilemma so many start-ups face. What happens when the San Jose Sharks come live with a suburban family in their San Jose home? Well, the short answer is, not much. They’re pretty boring, actually. They hang around, do some chores, clip their nails, maybe plunge the occasional toilet. And that’s the point. The Sharks aren’t much fun hanging around at your house. It’s better to come watch them at our house. And that’s the premise of our new San Jose Sharks campaign. The Sharks have the fans. They’re some of the most loyal in the NHL actually. But the goal was to move them from TV-watching fans to game-attending fans. To make the point, we brought the Sharks players to a home in suburban San Jose and filmed them doing a bunch of mundane tasks and chores. We had them clean the grill, brush their teeth, paint miniature civil war figurines, you know, boring stuff. Turns out, even when they’re boring, they’re pretty damn funny. Joe Thornton ordering window treatments from a catalog. Joe Pavelski clipping his toe nails on the living room couch, Brendon Dillon looking for his loofa to take his bath. It’s funny. Anyone who finds a puck, enters a special code on the back good for two free tickets. The success of these promotions helped lead us to this new work. Thanks to Donavan Sell, Director of Photography and an amazing crew who worked like mad to get it all done. What's Klay Thompson’s Pre-Game Ritual? A lot of NBA players have pre-game rituals. For some, it’s habit, for others superstition. Jason Terry wore the shorts of the opposing team to bed the night before each game. Kevin Garnett ate a PB&J before every game. While Kevin Durant unties and reties his shoes on the scorer’s table just before tipoff. But Warriors guard Klay Thompson keeps it simple; he reads the newspaper. 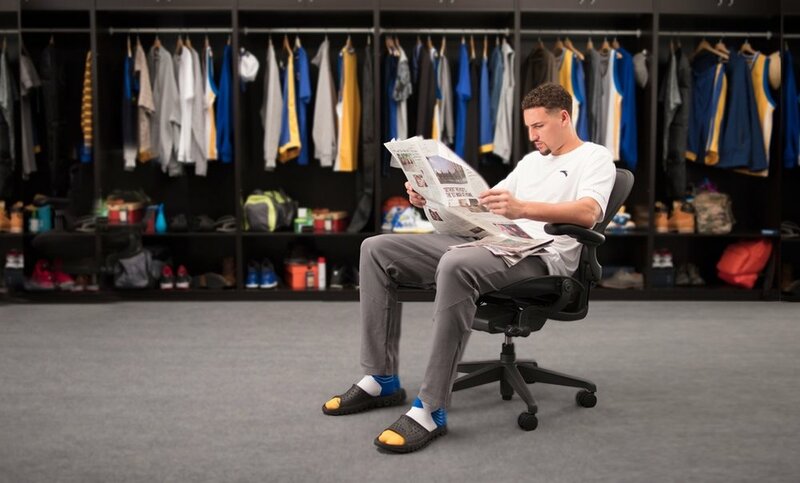 Before every game, the Warriors PR team puts a fresh newspaper in front of his locker for Klay to read before tipoff. On the road, any paper will do. When he’s at home, Klay prefers the local East Bay Times. The Bay Area News Group owns East Bay Times along with the Mercury News and Marin IJ. And they came to us and asked for a campaign to help boost sagging newspaper readership among a younger demographic. After a little research, we found out about Klay’s story. And we decided to just tell it honestly without getting in the way. Klay’s gotten attention recently for his dance club moves in China and a commercial where he bathes in a bathtub full of shoes. But this is different. An NBA star who reads an old-school newspaper shows a guy who’s clearly a lot deeper than he previously appeared. And maybe a generation of people who have foregone traditional news organizations in favor of news via social media will sit up, take notice and start a new ritual of their own. Thanks to John Madden’s Goal Line Studio, DP Lou Weinert, Producer Ben Latimer and a great client team lead by Olga Mitina. It's Official: Advertising is Art. What happens when a small, San Francisco ad agency teams up with the largest modern and contemporary art museum in the country? For example, the Golden Gate Bridge is juxtaposed against Mark Rothko’s similarly colored painting, No. 14, 1960. While a rainbow flag flying in the Castro sits alongside Ellsworth Kelly’s painting, Spectrum I. The goal is to inspire the 25 million annual visitors to San Francisco to visit SFMOMA along with the bridge, Alcatraz, cable cars and the like. When we started the project, our research showed that of the favorite destinations for tourists coming to San Francisco, museums rarely cracked the top 10. Even though SFMOMA is the largest modern and contemporary art museum in America. We also found that while the majority of travelers use social media and the internet to plan their trip, 85% of the final decisions are actually made on the ground after people arrive. So the campaign utilizes social and digital to build awareness when people are planning their travel and then uses outdoor and geo fenced mobile to target people while they’re visiting other places around the city. All the artists’ estates were incredibly gracious in letting us use their work. Huge thanks to XYZ who did all final production and helped us ensure that we were reproducing these amazing works of art accurately. You can check out more of the work here. An oversized retail stunt for Shopkick. Nearly 500 rolls of toilet paper were used to build a shoe that stands over 8 feet tall. Shopkick is a mobile app that allows people to earn points whenever they buy stuff. And you trade the points for gift cards. So buy a bunch of toilet paper and you earn money to buy, say, some new shoes. So we did. It’s a 10-foot tall stiletto built out of nearly 1000 rolls of toilet paper. We actually built three different TP shoe sculptures to anchor sign-up events across the country. Shopkick beacons are inside Target, Bestbuy, Marshalls, CVS and hundreds of other retailors. Hopefully our little stunt will get more people on the platform. WANTED: Small Ad Agency with B2B Experience. Sort of. As one of the premier small ad agencies in San Francisco, we're asked often about our B2B experience. We've executed a lot of B2B campaigns for a variety of different clients. But those campaigns have been successful not because we have B2B experience, but because we have B2C experience. And, because we think both those terms are passe' and need to be retired. And there is no distinction between a person “at work” and a person “at home.” They’re always “at both.” We can’t manage to put our phones down at the dinner table, or stay off Instagram at the conference table. And where we happen to be located when we see a message does not change the way we make purchase decisions. It just doesn't. The purchase process is the same no matter how long the purchase funnel is. People need awareness. People want brand value. People read information and content about a category and products. People consult friends and colleagues. And ultimately, people make emotional decisions based on rational input because that’s the way people are. Humans make emotional decisions no matter their physical location. They’re insecure and need to feel like they made the right decision whether their boss is judging them or their spouse is judging them. SAP, IBM, GE and HP have done some of the world’s best advertising. Is it business to business? Apple, Nike, AT&T and VW have done some of the world’s best advertising. Is it consumer advertising? How does bad advertising happen? We’ve all asked ourselves that at one time or another because there is so much talent out there and so many great agencies and yet, still, so much bad work. Of course, a lot of things contribute to the caca that pervades. But there is one belief about the purchase process that is fundamentally false. And it is the one belief that causes so many of the problems. Companies believe, too often, that people make rational decisions.But they don’t. People don’t buy things for rational reasons. People make emotional decisions and then rationalize them. That’s true for everything we buy from cars, to clothes, to facial cleansers. We buy for emotional reasons and then we justify the purchase by citing product benefits. NOT the other way around. - Create ads with "talk value"
Now that said, there is, and always will be, a need for rational benefits in the purchase funnel. Because once people are emotionally taken by a brand, they need rational reasons to justify the purchase. But they need to react emotionally first. Anyway, hope that helps, Marty. Something to keep in mind tonight when you're watching The Voice and that floor cleaner commercial comes on that you love so much.